Middle East. North is at top. 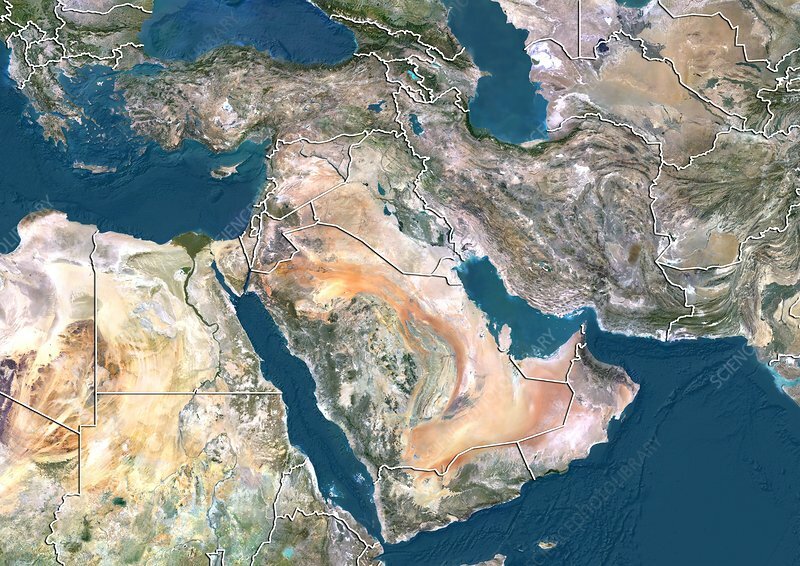 Satellite image of the Middle East, showing the borders (white lines) of the countries. The Middle East is a Eurocentric term used to describe a region that roughly encompasses Western Asia. The Mediterranean Sea (blue, upper left), Black Sea (blue, top left), Caspian Sea (blue, top right), Red Sea (blue, centre left), Indian Ocean (blue, lower left), and Persian Gulf (blue, centre right) can also be seen. Image compiled from data acquired by LANDSAT satellites, in 2012.